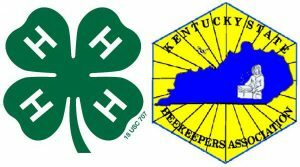 Each year KSBA and the Kentucky 4-H chapters sponsor a statewide honey bee essay contest. The winning essay is submitted to a national competition sponsored by the Federation for the Preservation of Honey Bees, Inc. Participants in the essay contest had to members of their local 4-H chapter and had to write an essay on “Bees and Pollination. How Important is it?” This year’s state winner was Rebekah Waddle of Munfordville. The runner-up was Rachel Millward of Erlanger. Congratulations to both Rebekah and Rachel. Also, good luck to Rebekah in the national competition. Details for the next competition are not available yet. Any 4-H students interested in participating should contact their local 4-H office for contest details. Additional information will also be posted in the KSBA news section of our website as it becomes available.